In the first three chapters of Romans, Paul focused on the need to enter into the gospel covenant; in Romans 4–8, Paul taught about life in the covenant﻿—a quality of life that might be called life “in Christ Jesus” (Romans 8:1). Having taught that justification comes by faith in Jesus Christ and not by performances of the law of Moses (see Romans 3:21–31), Paul supported this doctrine by citing the example of Abraham, who lived hundreds of years before the law of Moses was given (see Romans 4). Chapter 5 of Romans represents a turning point in the epistle, for Paul began to teach about life in Christ. In the gospel covenant, “we have peace with God” and “access by faith into this grace wherein we stand” (Romans 5:1–2). Paul clarified that God’s grace does not condone sin, but it empowers us to overcome sin (see Romans 6:1–8:13). Entering the gospel covenant through baptism symbolizes our death to sin and our “newness of life” in Christ (Romans 6:4; see also verses 3–11). When we are faithful in that covenant relationship, we become “heirs of God, and joint-heirs with Christ” (Romans 8:16–17). Since Abraham lived centuries before the law of Moses was given, he was an ideal example of someone who was justified through faith in Jesus Christ and not through the law of Moses (see also Galatians 3:6, 17). Quoting from Genesis, Paul noted that “Abraham believed [had faith in] God, and it was counted unto him for righteousness [justification]” (Romans 4:3; see also Genesis 15:6). Abraham received this assurance before he was circumcised (see Romans 4:9–12). Under the law of Moses, circumcision was the rite by which male Israelites “accepted the responsibilities of the covenant” (Guide to the Scriptures, “Circumcision”; scriptures.lds.org). Thus, Paul was able to show from scripture that individuals were not justified through obedience to the law of Moses﻿—they were justified through faith in God’s promises. Referring to Abraham also allowed Paul to teach what it means to have faith, for Abraham was “strong in faith” (Romans 4:20) and was revered by Jews (those of the circumcision) and believing Gentiles (the uncircumcised) as the “father” of the faithful (see Romans 4:11–12, 16). “For if Abraham were justified by the law of works, he hath to glory in himself; but not of God. “For what saith the scripture? Abraham believed God, and it was counted unto him for righteousness. “Now to him who is justified by the law of works, is the reward reckoned, not of grace, but of debt. “But to him that seeketh not to be justified by the law of works, but believeth on him who justifieth not the ungodly, his faith is counted for righteousness” (in the Bible appendix). “Neither the unconditional nor the conditional blessings of the Atonement are available except through the grace of Christ. Obviously the unconditional blessings of the Atonement are unearned, but the conditional ones are not fully merited either. By living faithfully and keeping the commandments of God, one can receive additional privileges; but they are still given freely, not technically earned. The Book of Mormon declares emphatically that ‘there is no flesh that can dwell in the presence of God, save it be through the merits, and mercy, and grace of the Holy Messiah’ [2 Nephi 2:8]” (“The Atonement of Jesus Christ,” Ensign or Liahona, Mar. 2008, 36). In Romans 4–6, Paul repeatedly used the Greek terms charis (translated as “grace”) and charisma (translated as “the free gift” in Romans 5:15–16) as he expounded on the doctrine of grace that he had introduced earlier (see Romans 3:24). “Grace is the help or strength given through the Atonement of the Lord Jesus Christ. Through the grace of God, everyone who has lived will be resurrected﻿—our spirits will be reunited with our bodies, never again to be separated. Through His grace, the Lord also enables those who live His gospel to repent and be forgiven. “… To receive this enabling power, we must obey the gospel of Jesus Christ, which includes having faith in Him, repenting of our sins, being baptized, receiving the gift of the Holy Ghost, and trying to follow the teachings of Jesus Christ for the rest of our lives (see Ephesians 2:8–9; James 2:17–22; 2 Nephi 25:23; 31:20). “The grace of God helps us every day. It strengthens us to do good works we could not do on our own. The Lord promised that if we humble ourselves before Him and have faith in Him, His grace will help us overcome all our personal weaknesses (see Ether 12:27)” (lds.org/topics/grace; for further information on grace, see the commentary for Romans 3:23–24). Joseph Smith Translation, Romans 3:24. “Therefore being justified only by his grace through the redemption that is in Christ Jesus” (in Romans 3:24, footnote a). Joseph Smith Translation, Romans 4:4, 16. “To him that worketh is the reward not reckoned of grace, but of debt. … Therefore ye are justified of faith and works, through grace” (in Romans 4:16, footnote a). Salvation from sin is not something that God owes us, like a debt, nor is it something we earn solely by our actions (see Romans 3:23; 5:8). Like the promise God gave Abraham, salvation is something that God has graciously offered us. We receive this gift by placing our faith in Jesus Christ. But even after all we do to receive this gift of salvation, it remains a gift from God (see 2 Nephi 25:23). To “stand” can mean to be in a condition or state (our standing) and to remain firm or upright. Thus, when we have placed our faith in Jesus Christ by entering the gospel covenant, we then (1) stand in a state of favor with God and (2) receive strength from God to remain faithful. The Atonement of Jesus Christ, which is the supreme manifestation of God’s grace, completely overcame the effects of the Fall (see Romans 5:14–21) and is more than ample in its power to enable us to overcome sin and be forgiven. The Lord’s grace is “sufficient” for us (see 2 Corinthians 9:8; Ether 12:26–27; Moroni 10:32; D&C 17:8). God’s grace does not condone sin; it is empowering. It enables us to become “dead to sin” (Romans 6:2). The Joseph Smith Translation of Romans 4:16 reads, “Therefore ye are justified of faith and works, through grace” (in Romans 4:16, footnote a). This prevents the misreading that faith is merely a passive belief, resulting in no changes to one’s behavior, loyalty, or character. Paul saw faith as a principle of action. The Greek words Paul used for “faith” (pistis) and “to have faith” or “to believe” (pisteuō) both imply a deep conviction that results in personal commitment and action. The words have connotations like trust, confidence, faithfulness, and obedience. Thus, Paul wrote of “obedience to the faith” or the obedience that comes from faith (Romans 1:5; 16:26), “obey[ing] the gospel” (Romans 10:16), and even “obedience unto righteousness” (Romans 6:16). In Paul’s thinking, those who have faith in Jesus Christ naturally repent, receive the ordinance of baptism, receive the Holy Ghost, and endure in faith (see Acts 16:30–33; 19:1–6; Romans 6:1–11; 1 Corinthians 6:9–11; 2 Corinthians 10:5). Similarly, Elder Joseph B. Wirthlin (1917–2008) of the Quorum of the Twelve Apostles stated that without obedience, “all we have is a counterfeit, a weak and watered-down faith” (“Shall He Find Faith on the Earth?” Ensign, Nov. 2002, 83). For more information on how true faith is manifest in one’s actions, see the commentary for James 2:14–26. What phrases in these verses describe Abraham’s faith? What can you learn from these verses about what it means to be strong in faith? “I think of newly called missionaries leaving family and friends to face, on occasion, some rejection and some discouragement and, at least in the beginning, a moment or two of homesickness and perhaps a little fear. “… Some blessings come soon, some come late, and some don’t come until heaven; but for those who embrace the gospel of Jesus Christ, they come” (“An High Priest of Good Things to Come,” Ensign, Nov. 1999, 36, 38). What phrases in these verses describe the blessings that come to those who are justified by placing their faith in Jesus Christ? In what ways have you experienced these blessings in your life? Paul’s teaching that “hope maketh not ashamed” (Romans 5:5) means that our hope in God’s promises will not disappoint us. From this verse we also learn that the “love of God” is a gift to us through the Holy Ghost. The scriptures sometimes describe grace as something we receive from God as a result of what we do. For example, some scriptures teach that our actions can cause us to grow in grace or fall from grace (see John 1:16; Galatians 5:4; 2 Peter 3:18; D&C 93:12–13, 19–20). However, other scriptures describe grace as something we receive from God independent of any action of our own. Romans 5:6–8 is an example of such a scripture. In these verses Paul taught that Jesus Christ died for us “while we were yet sinners,” which is a manifestation of God’s love for us (Romans 5:8; see also John 3:16; 1 John 4:19). The Atonement was not something we earned or deserved but was a “free gift” (Romans 5:15), given “when we were yet without strength” (Romans 5:6), or when we were utterly helpless and powerless. Thus, the gift of God’s Son is an example of grace as the unmerited favor and assistance God is predisposed to give His children. In Romans 5, Paul repeatedly used the phrase “much more” to show how the grace and blessings of the Atonement are more than sufficient to meet our spiritual needs. Romans 5:6–10 teaches that while “we were enemies”﻿—meaning while we were sinful and powerless to save ourselves﻿—God sent His Son so we could be “reconciled” to God. Now that we are reconciled﻿—meaning that we have accepted the Savior’s Atonement and entered into a covenant relationship with Him﻿—we can be “much more” certain that God will continue to work with us for our salvation. Romans 5:15, 17 teaches that the Fall of Adam brought death into the world and affected all of us, but the Atonement of Jesus Christ brought grace into the world with even greater effect. Romans 5:20 teaches that though our sins may “abound,” the grace of God through the Atonement abounds “much more,” and God’s grace is sufficient to help us overcome all our sins and weaknesses (see also Ether 12:27). President Boyd K. Packer (1924–2015) of the Quorum of the Twelve Apostles affirmed: “Save for the exception of the very few who defect to perdition, there is no habit, no addiction, no rebellion, no transgression, no apostasy, no crime exempted from the promise of complete forgiveness. That is the promise of the atonement of Christ” (“The Brilliant Morning of Forgiveness,” Ensign, Nov. 1995, 20). Romans 5:11 is the only verse in the King James Version of the New Testament that uses the word atonement; however, a related term, reconciliation, is found in other New Testament passages (see Romans 5:10; 11:15; 2 Corinthians 5:18–20; Ephesians 2:16; Colossians 1:20–21). Both of these words denote a change from hostile to friendly terms, the reestablishment of an interrupted or broken relationship, and the restoration of harmony between two parties. Elder Bruce R. McConkie (1915–85) of the Quorum of the Twelve Apostles defined reconciliation as “the process of ransoming man from his state of sin and spiritual darkness and of restoring him to a state of harmony and unity with Deity” ( Doctrinal New Testament Commentary, 3 vols. [1965–73], 2:422). New Testament authors also used other terms, translated as redemption or ransom, to refer to the Atonement of Jesus Christ (see Mark 10:45; Romans 3:24; 8:23; Ephesians 1:7, 14; Colossians 1:14; Hebrews 9:12, 15). “I weep for joy when I contemplate the significance of it all. To be redeemed is to be atoned﻿—received in the close embrace of God, with an expression not only of His forgiveness, but of our oneness of heart and mind” (“The Atonement,” Ensign, Nov. 1996, 34). Left: Adam and Eve, by Douglas M. Fryer. Right: Jesus Said to Her, “Mary,” by William F. Whitaker Jr.
As “the figure of him that was to come,” Adam was a type or foreshadowing of Jesus Christ (Romans 5:14). In Romans 5:12–21, Paul contrasted the effects of the Fall of Adam and the Atonement of Christ. Paul was the only New Testament writer to expound on how the Atonement overcomes the effects of the Fall (see also 1 Corinthians 15:21–22, 45–49), although several Book of Mormon prophets also taught about this concept (see 2 Nephi 2:25–26; 9:6–7, 21; Alma 42:2–15; Mormon 9:12). Paul reminded members of the Church that they had been “baptized into Jesus Christ,” thus entering into a covenant relationship with Christ (see Romans 6:1–4). For Church members to choose to continue in sin was incompatible with that covenant relationship. Further, Paul taught that baptism symbolized being “buried with [Christ]” and becoming “dead … unto sin, but alive unto God” (Romans 6:4, 11). Baptism is a rebirth, symbolized by coming up out of the waters of baptism. Just as we were born into the world and became a living soul, so we must be born again and become a member of God’s kingdom﻿—both births involve the common elements of water, blood, and spirit (see Moses 6:59–60). Elder L. Tom Perry (1922–2015) of the Quorum of the Twelve Apostles explained: “According to the Apostle Paul, baptism … denotes our descent into a watery grave from which we are raised with ‘newness of life’ (Romans 6:4) in Christ. The ordinance of baptism symbolizes Christ’s death and Resurrection﻿—we die with Him so we can live with Him” (“The Gospel of Jesus Christ,” Ensign or Liahona, May 2008, 46). In addition, Paul’s comparison of baptism to burial indicates that baptisms were performed by immersion﻿—the same way Jesus was baptized. “When we are baptized, we take upon ourselves the sacred name of Jesus Christ. Taking upon us His name is one of the most significant experiences we have in life. Yet sometimes we pass through that experience without having a full understanding. “… I pray that each of us as members of His kingdom will understand that our baptism and confirmation is the gateway into His kingdom. When we enter, we covenant to be of His kingdom﻿—forever!” (“The Covenant of Baptism: To Be in the Kingdom and of the Kingdom,” Ensign, Nov. 2000, 8–9). Frequently in Paul’s writing, the Greek word translated “servant” also means “slave,” and Paul used the imagery of slavery to teach about the spiritual consequences of choosing to sin. Since slavery was a common institution in the Roman Empire, Paul’s audience would have readily identified with metaphors like yielding to God as servants would yield to their master (see Romans 6:13) and being slaves to sin (see Romans 6:17, 20). A pair of old handcuffs (a still image by John Luke from the film Impressions of a Prophet ). Paul used the imagery of slavery to teach about the effects of yielding ourselves to sin or to God. Slaves in ancient Rome could purchase their freedom or be freed by their masters. Continuing his slavery analogy, Paul taught that the price of freedom from sin was paid by Jesus Christ through His Atonement (Romans 3:24); however, freedom could be realized in the lives of His followers only as they chose to abandon sin and become “servants of righteousness” (Romans 6:18). “From an initial experiment thought to be trivial, a vicious cycle may follow. From trial comes a habit. From habit comes dependence. From dependence comes addiction. Its grasp is so gradual. Enslaving shackles of habit are too small to be sensed until they are too strong to be broken. … Addiction surrenders later freedom to choose” (“Addiction or Freedom,” Ensign, Nov. 1988, 6–7). In Romans 6:16–23, Paul described the rewards of both sin and righteousness. Sin leads to spiritual death, but “the gift of God is eternal life” (Romans 6:23). Being “saved in the kingdom of God … is the greatest of all the gifts of God; for there is no gift greater than the gift of salvation” (D&C 6:13). “[In Romans 7:1–4, Paul] compares Israel’s allegiance to the law of Moses with that of a wife to her husband. As long as her husband lives, a wife is bound to him, must obey his laws, and if she be with another, she is an adulteress. But when the husband dies, he can no longer direct her actions, and she is free to marry another; she can no longer be subject to him that is dead. “So with Israel and the law. As long as the law lived, and was therefore in force, Israel was married to it and required to obey its provisions. … But now the law is fulfilled; it no longer lives; it has become dead in Christ; and Israel is married to another, even to Christ, whose gospel law must now be obeyed” ( Doctrinal New Testament Commentary, 2:253–54). Some devout Jews had accused Paul of speaking blasphemously against the law of Moses (see Acts 21:28). In Romans 7–8, Paul clarified his position by explaining that the law of Moses was good, but it had limitations. The law taught what sin was﻿—“for by the law is the knowledge of sin”﻿—and therefore the law was holy (see Romans 3:20; 7:7, 12–13). But the law could not overcome the effects of the Fall, which makes mankind “carnal, sold under sin” (Romans 7:14), and the law alone could not correct the problem of human weakness or provide means for people to be transformed by the Spirit (see Romans 8:3–4; Galatians 3:21). For that, we need the grace made available through the Atonement of Jesus Christ. 14 For we know that the commandment is spiritual; but when I was under the law, I was yet carnal, sold under sin. In Romans 7–8, Paul wrote about the conflict between “the inward man” and “the flesh” (Romans 7:22, 25; see also Galatians 5:17). Because of the Fall, our mortal bodies sometimes experience feelings and desires which, if followed, lead to acts contrary to the laws of God (see 2 Nephi 2:29; Ether 3:2). Paul used first-person pronouns in this passage﻿—“I,” “my flesh,” “sin dwelleth in me,” and so on﻿—but his teachings describe the inner struggle common to all who strive to live the laws of God. Like other ancient writers, he sometimes wrote in first person rhetorically to discuss conditions that applied to all people (see Romans 3:7; 1 Corinthians 13:1–3). Paul’s statement, “With the mind I myself serve the law of God; but with the flesh the law of sin” (Romans 7:25), does not mean that Paul yielded to temptations of the flesh, but it meant that even as he yielded to God, his flesh opposed him. The crucial point for Paul was that he knew the source of deliverance from the weakness of the flesh (compare Isaiah 6:6–8; 2 Nephi 4:19–20). “When deepening trials come your way, remember this glorious promise of the Savior: ‘To him that overcometh will I grant to sit with me in my throne, even as I also overcame, and am set down with my Father in his throne.’ (Rev. 3:21. )” (“Self-Mastery,” Ensign, Nov. 1985, 32). In Romans 8:1–13, Paul referred often to the “Spirit” and to the “flesh.” With the word Spirit, he was primarily referring to “the law of the Spirit of life in Christ Jesus” (Romans 8:2), or to the atoning sacrifice of Jesus Christ and the gospel of Jesus Christ established after the law of Moses. With the word flesh, he was primarily referring to the law of Moses, which was “weak through the flesh” (Romans 8:3). Elder Bruce R. McConkie said of Romans 8:1–13: “Life and peace come, not through the law of Moses, but through Christ and his saving grace. The Mosaic performances deal with carnal things, the things of the flesh, the things of death. There is not power in them to atone, to ransom, to save, to bring joy and peace here and eternal life hereafter. But Christ deals with spiritual things, the things of the Spirit, the things that bring life. Because of him, ‘he who doeth the works of righteousness shall receive his reward, even peace in this world, and eternal life in the world to come.’ (D. & C. 59:23. )” ( Doctrinal New Testament Commentary, 2:259–60). Some groups in Christianity and other religious traditions have believed that the only way to overcome desires of the flesh is to abstain completely from physical pleasures. However, many physical pleasures are not sinful, but are good. Paul taught that the companionship of the Holy Spirit can make it possible for us to use our bodies according to God’s purposes for His children. The Spirit can “mortify [put to death or subdue] the deeds of the body” and impart spiritual life (Romans 8:13; see also Galatians 5:16). Elder Parley P. Pratt (1807–57) of the Quorum of the Twelve Apostles similarly taught: “The gift of the Holy Ghost … purifies all the natural passions and affections, and adapts them, by the gift of wisdom, to their lawful use” ( Key to the Science of Theology , 61). The scriptures speak of us as “children of God” in more than one sense (Romans 8:16). First, every human being is literally a beloved spirit child of Heavenly Father (see Malachi 2:10; Acts 17:29; Hebrews 12:9; “The Family: A Proclamation to the World,” Ensign or Liahona, Nov. 2010, 129). Second, we are “reborn” as children of God through a covenantal relationship when we manifest faith in Jesus Christ, repent, are baptized, and receive the Holy Ghost (see John 1:12; Galatians 3:26–29; Mosiah 5:7; D&C 11:30; Moses 6:65–68). The context of Romans 8:16 makes clear that Paul was speaking of the second, covenantal meaning when he stated, “We are the children of God.” The children of God that Paul spoke of were those who, by virtue of their covenant relationship with Christ, were “led by the Spirit of God” (Romans 8:14). The companionship of the Holy Ghost is God’s assurance that we are His covenant children and that if we are faithful we will one day be “glorified together” with Jesus Christ (Romans 8:16–17). The blessings Paul discussed in Romans 8﻿—blessings such as being “heirs of God” (verse 17), the Spirit’s intercession on our behalf, and the full manifestations of God’s enduring love﻿—are enjoyed by God’s covenant children, but not necessarily by all of His spirit children. Caesar Augustus (see Luke 2:1), who was the ruler of Rome at the time of Christ’s birth, was adopted by his predecessor, Julius Caesar. 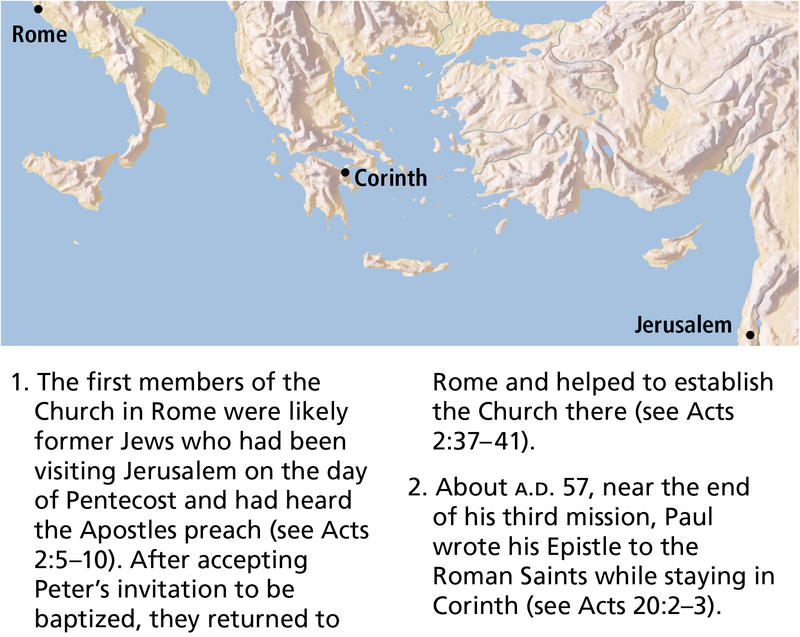 Adoption was common in the Roman world and would have been a familiar concept to Paul’s readers. A person who legally adopted someone conferred on that person all the rights and privileges that a natural-born child would have. Therefore, when we receive “the Spirit of adoption” (Romans 8:15) through entering the gospel covenant, we become the children of God and “joint-heirs with Christ” (Romans 8:17). In the Garden of Gethsemane, the Savior addressed God in prayer using the Aramaic term abba, which means “father” or “my father” (see Mark 14:36). The Savior instructed His followers that they too were to address God as their Father in Heaven (see Matthew 6:9; Luke 11:2). Paul’s statement, “We cry Abba, Father” (Romans 8:15), indicates that early Christians followed the Savior’s way of addressing God. They may have felt that “Father” reflected the close, personal relationship they enjoyed with God. Of all the titles that refer to God’s greatness, “Father” is the one He has asked His children to use when calling upon Him. Elder Bruce R. McConkie explained what it means to be “joint-heirs with Christ” (Romans 8:17): “A joint-heir is one who inherits equally with all other heirs including the Chief Heir who is the Son. Each joint-heir has an equal and an undivided portion of the whole of everything. If one knows all things, so do all others. If one has all power, so do all those who inherit jointly with him” ( Mormon Doctrine, 2nd ed. , 395). President Dallin H. Oaks of the First Presidency taught that becoming “heirs of God” means that we become like God: “In the theology of the restored church of Jesus Christ, the purpose of mortal life is to prepare us to realize our destiny as sons and daughters of God﻿—to become like Him. … The Bible describes mortals as ‘the children of God’ and as ‘heirs of God, and joint-heirs with Christ’ (Rom. 8:16–17). It also declares that ‘we suffer with him, that we may be also glorified together’ (Rom. 8:17) and that ‘when he shall appear, we shall be like him’ (1 Jn. 3:2). We take these Bible teachings literally. We believe that the purpose of mortal life is to acquire a physical body and, through the atonement of Jesus Christ and by obedience to the laws and ordinances of the gospel, to qualify for the glorified, resurrected celestial state that is called exaltation or eternal life” (“Apostasy and Restoration,” Ensign, May 1995, 86). “… We can have a greater appreciation for that which He did, and we can feel His spirit succoring us, and we can know the Savior in a very real sense” (“That They Might Know Thee,” Ensign or Liahona, Nov. 2006, 99–101). To intercede is to plead or act on behalf of another person. In Romans 8:26–27, Paul taught that at times “we know not what we should pray for as we ought: but the Spirit itself maketh intercession for us with groanings that cannot be uttered.” Speaking of the Spirit’s intercession for us, Elder Bruce R. McConkie explained that the Holy Ghost “gives direction to the faithful, causing them to know and speak the mind and will of the Lord. Perfect prayers are always inspired by the Spirit, and they are always answered, because the Spirit knows beforehand ‘what ye should pray for’” ( Doctrinal New Testament Commentary, 2:266; see also D&C 50:29–30). “The Apostle Paul taught an interesting lesson only a few years before the Saints in Rome were to face some of the most violent persecution of any Christian era. Paul reminded the Saints that ‘all things work together for good to them that love God’ [Romans 8:28]. Our Heavenly Father, who loves us completely and perfectly, permits us to have experiences that will allow us to develop the traits and attributes we need to become more and more Christlike. Our trials come in many forms, but each will allow us to become more like the Savior as we learn to recognize the good that comes from each experience. As we understand this doctrine, we gain greater assurance of our Father’s love. We may never know in this life why we face what we do, but we can feel confident that we can grow from the experience” (“All Things Work Together for Good,” Ensign or Liahona, May 2010, 101). The Prophet Joseph Smith (1805–44) spoke of what it means to be conformed to the image of God’s Son: “After God had created the heavens and the earth, he … said, ‘Let us make man in our own image.’ In whose image? In the image of the Gods created they them, male and female, innocent, harmless, and spotless, bearing the same character and the same image as the Gods [see Genesis 1:26–27]. And when man fell he did not lose his image, but his character still retained the image of his Maker. Christ, who is the image of man, is also the express image of his Father’s person [see Hebrews 1:3]. … Through the atonement of Christ and the resurrection, and obedience to the gospel, we shall again be conformed to the image of his Son, Jesus Christ [see Romans 8:29]; then we shall have attained to the image, glory, and character of God” ( Teachings of Presidents of the Church: Joseph Smith , 52; see also 2 Corinthians 3:18; 1 John 3:2; Alma 5:14). “Some Latter-day Saints have tended to focus on Christ’s Sonship as opposed to His Godhood. As members of earthly families, we can relate to Him as a child, as a Son, and as a Brother because we know how that feels. We can personalize that relationship because we ourselves are children, sons and daughters, brothers and sisters. For some it may be more difficult to relate to Him as a God. And so in an attempt to draw closer to Christ and to cultivate warm and personal feelings toward Him, some tend to humanize Him, sometimes at the expense of acknowledging His Divinity. So let us be very clear on this point: it is true that Jesus was our Elder Brother in the premortal life, but we believe that in this life it is crucial that we become ‘born again’ as His sons and daughters in the gospel covenant” (“Building Bridges of Understanding,” Ensign, June 1998, 67). In Romans 8:29–30, the Greek term translated as predestinate means “to appoint beforehand” and refers to the foreordination some people receive, based on God’s foreknowledge, to follow Jesus Christ and become like Him (see also Ephesians 1:3–4; 1 Peter 1:2). “Foreordination does not guarantee that individuals will receive certain callings or responsibilities. Such opportunities come in this life as a result of the righteous exercise of agency, just as foreordination came as a result of righteousness in the premortal existence” (“Foreordination,” True to the Faith: A Gospel Reference , 69; see also Alma 13:3–4). Paul said in this verse that God is on our side and is working on our behalf. What indications do you see in Romans 8:26–39 that “God [is] for us”? The Darkness at the Crucifixion, by Paul Gustave Doré. “God commendeth his love toward us, in that, while we were yet sinners, Christ died for us” (Romans 5:8). “Considering the incomprehensible cost of the Crucifixion and Atonement, I promise you He is not going to turn His back on us now. … Brothers and sisters, whatever your distress, please don’t give up” (“Broken Things to Mend,” Ensign or Liahona, May 2006, 71). In Romans 8:37, the Greek phrase translated as “more than conquerors” means “abundantly victorious” and “winning an overwhelming victory.” This term mirrors Paul’s “much more” passages in Romans 5:9–20, which emphasize that the grace of God made available through the Atonement of Jesus Christ is more powerful than the effects of the Fall. When have you experienced God’s grace in the form of daily strength and assistance to remain faithful? When have you experienced grace to help you overcome sin? What truths in Romans 6:1–11 could you ponder the next time you partake of the sacrament to renew your baptismal covenant? Write a one-page paper that explores the misconceptions about grace that you see in the statements above. Be sure to include truths Paul taught about grace that could help people with misconceptions like these.